Some politicians are fond of claiming that the “baptism barrier” debate regarding Irish schools is just a local issue confined to oversubscribed schools in affluent parts of Dublin. For a provincial issue, it is making international waves. The New York Times recently carried a large feature on the “Catholic Church’s hold on schools in a changing Ireland”. Now Hindus across the globe have urged Pope Francis to “fix Ireland’s education system”as a matter or urgency. Hindu statesman Rajan Zed, president of Universal Society of Hinduism, says religion should not play any role in admissions to Irish schools. “The practice of a religious majority controlling the school doors, and schools indulging in kind of state-sanctioned indoctrination is simply wrong and should end,” he says. The people of Ireland have shown a commendable willingness to strike anachronistic bias from the country’s laws, most emphatically in legalizing gay marriage last year in a referendum approved by three out of five voters. With a general election expected next month, a movement is underway in the rapidly changing nation to target another hurtful social condition by which non-Catholic children are legally denied seats at overcrowded state-financed primary schools, 97 percent of which are controlled by Catholic authorities. With schools allowed to give preference to Catholics, other families are forced to have their children baptized in the church, linger on school waiting lists or search for scarce alternatives. Only 74 of the nation’s 3,200 primary schools are run by Educate Together, the main multidenominational alternative, whose Dublin schools are swamped with four applications for every available space. The public is fast realizing this is an intolerable situation in a country with an increasing immigrant population of non-Catholics and a rising generation of younger nonpracticing Catholics. A poll last month measured almost 85 percent public approval for changing the law so it no longer tolerates religious bias against schoolchildren. There is a citizens’ petition to repeal the law and a legal challenge is planned by Education Equality, an advocacy group. The bias clause has been challenged by the United Nations Committee on the Rights of the Child, and the Irish Human Rights and Equality Commission has taken a position against it, too. Church officials are at odds, with some urging a slow evolution toward a more open-door policy in the schools. Clearly the current policy is at odds with a modern Ireland. 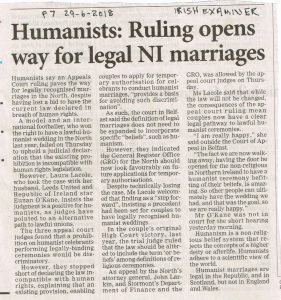 The most encouraging force in the debate is the Irish public’s realization that their nation can no longer afford shameful religious bias to remain in the law. The Irish state is pushing parents to the brink of despair with its religion-based school enrolment laws. I can vouch for this because I am one of them. The birth of my beautiful boy Cormac back in March was a time of unbridled joy, but I learned shortly afterwards that our local state primary school is oversubscribed. Since then, because he is not baptised, the draining uncertainty as to where he might eventually be accepted has grown by the day, along with my understanding of the arcane world of school enrolment in Ireland. Irish law allows state-funded schools to turn away children and discriminate in enrolment on the basis of religion. Section 7(3)(c) of the Equal Status Act 2000 states that schools operated by religious institutions can favour children of their own denomination in enrolment – despite the fact they are entirely funded by taxpayers. In Ireland, about 90% of primary schools are controlled by the Catholic church (most of the remainder are under the patronage of other religious institutions), so this can fairly and accurately be called the “Catholics first” law – though in my experience most Catholics, including my close friends and relatives, consider it repugnant. Of course, the workaround is simple: get your child baptised and he or she could immediately leap to the top of the enrolment list. But in a 21st-century democracy, is this a fair and sensible basis on which to decide state school enrolment? Few would say yes, but the statistics suggest many parents take what may well be the wisest option, and proceed to baptise their children despite their own beliefs. A survey taken in Ireland this year showed that 93% of children were baptised, yet the same study showed that only about a third of children were taken to mass regularly. Moreover, the percentage of non-religious marriage ceremonies here has grown from 5% in 1994 to 30% in 2013. In the same period Catholic marriage ceremonies have fallen starkly. However, around one in five schools in Ireland are oversubscribed and it is impossible for parents to be sure from year to year which schools will fill up so the safest option in Ireland is simply to baptise. Needless to say, a country where over 96% of schools are controlled by religious institutions sees much debate around the influence of religion in education. Some people feel such institutions have no place at all in education, others feel religion classes in these state schools should take place outside class-time or at least at the end of the day to facilitate non-religious parents opting out. The repeal of the Catholics first law is a minimal step that will merely stop schools prioritising children on the basis of religion in the enrolment process. To draw a comparison, many hospitals in Ireland are owned by religious institutions but funded by the state – imagine if they operated admissions on a Catholics-first basis. There must be no more cases of Irish citizens seeing their children rejected by school after school on religious grounds. It is not right that a family should go through years of tension, stress and anxiety waiting to see if their child can simply attend the local school with their friends. That is what my family is facing. I started a petition for the repeal of section 7(3)(c) of the Equal Status Act 2000 because I think state-endorsed religious discrimination against five-year-olds is a really bad idea, and because there are much better ways of allocating school places. It is not possible for all children to attend the school around the corner – oversubscribed schools need criteria by which to decide which children will be accepted. But children should at least have an equal opportunity to attend that school. Democratic principles demand that state institutions be run in a fair and transparent manner. That over 96% of schools in a democratic country should have a child’s religion as the number one enrolment criterion is nothing short of a disgrace and an international embarrassment. I just want my little boy to be given a fair chance to go to the local school with the kids from the road and the local football club. As the law stands, he is very unlikely to do so.